I'm working on getting some healthy mushrooms into my body at the moment i.e. giving the immune system and my energy a good boost just to be up front with autumn. I've made some delicious warm mushroom lattes too. Shroom Cocoa Shake, Golden Milk Shroom & Shroom Chai. My taste buds are very positive towards these vegan cashew / chocolate slices and they always receive great feedback from others too. Not only do they taste yum, they are quite nutritious, and a good little snack for before or after training too. They are sugar-free, gluten-free, dairy-free and vegan. This recipe contains Chaga powder. Chaga is a mushroom that grows on birch trees. Unlike most fungus, chaga is hard and woody, bearing no resemblance to mushrooms. Instead, it looks more like a cracked piece of burned charcoal. 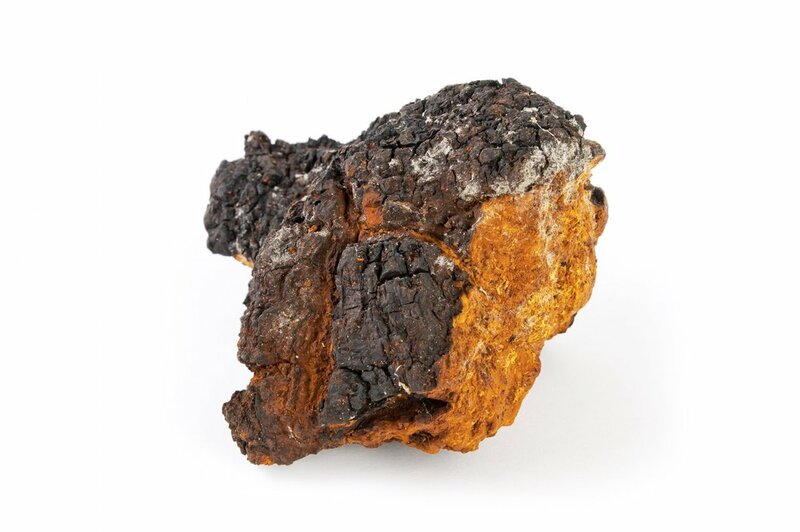 Chagaâ€™s black color is due to a concentration of melanin, the same pigment that colors human skin. Because chaga can be used to start fires, it is also known as the â€œtinder fungusâ€�. Immune boosting agent. Chaga has one of the highest ORAC scores of any food! ORAC stands for â€œOxygen Radical Absorbent Capacity.â€� The higher the ORAC score the better a foodâ€™s ability to protect the body from disease-causing free radicals. It also means that chaga mushrooms are one of the best sources of antioxidants. Anti-inflammatory. The compound ergosterol in chaga, along with related agents, shows strong anti-inflammatory activity. Chronic inflammations in the body are what can cause the immune system to overreact, and is often the what causes a large number of the diseases such as cardiovascular disease, diabetes, cancer, inflammation in the joints, arthritis, some types of dementia, overweight etc. Improve Physical Endurance. In animal studies, chaga has significantly improved physical endurance. One study with mice showed that when they were given chaga mushroom polysaccharides they were able to swim longer. The glycogen (fuel) content of both muscles and liver increased while lactic acid levels in the bloodstream decreased. Put that all together and itâ€™s a recipe for less fatigue and better endurance. This recipe contains links to ingredients and products that I use myself or can recommend. If you buy products through these links, the price will be the same for you, and I will receive a small commission, which helps to support this blog. You can read about my affiliate policy. Add everything except the dates to a food processor. Pulse until very small crumbs have formed. Add dates (ensure you remove pips), and pulse until the mix starts to clump together (if this doesn't happen, add more dates). If using matcha tea / spirulina, reserve some of the mixture, and stir in the powder to get the green colour, then spread on top of white mix and set in freezer . Melt 3/4 of the chocolate you need over a water bath. Stir the mixture until has reached to 40-45Â°C /104-113 Â°F (about 10 min.). Thermometer. Remove the bowl from the water bath and add the chocolate you have set aside - a little at a time. Stir until all chocolate is melted and until the temperature 29Â°C /84 Â°F is reached. Pour final layer onto cake, and reset in freezer.